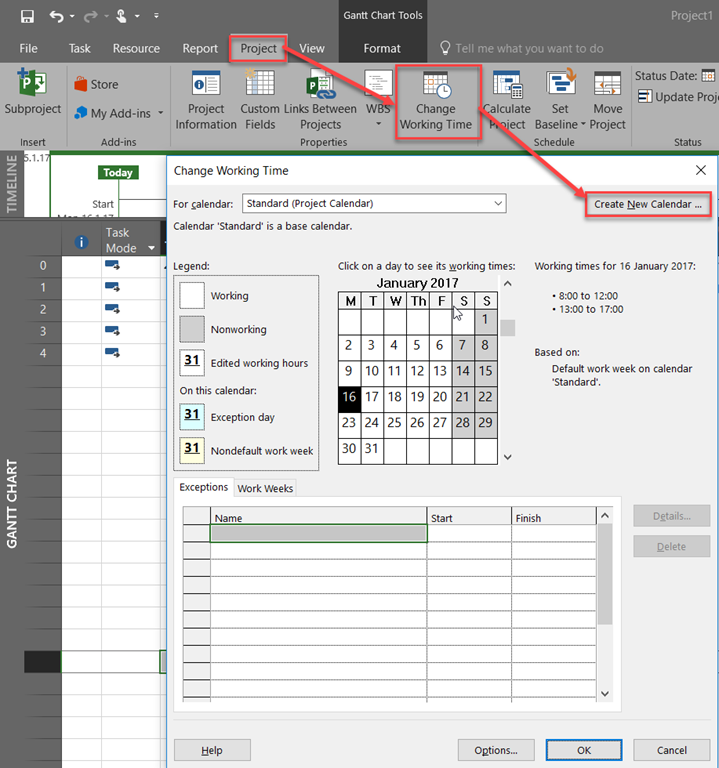 as we all know, there are three types of Calendars in MS PROJECT 2016: Base Calendars, Resource Calendars and Task Calendars. they are prioritized in that order (from low to high importance), which means that Task Calendar has the highest priority. When we are talking about Resource Calendars, we all know why and when to use it. For example, if 12 resources has a common days off, or working hours, we will create Resource Calendar and assign it to those resources. But why to use Task Calendar? Let’s suppose that we have few (or many) Tasks that should be, for example, done in a certain location. And that this location is for some reason available to work at only from Monday to Wednesday, and that it can not be work at Thursday and Friday. 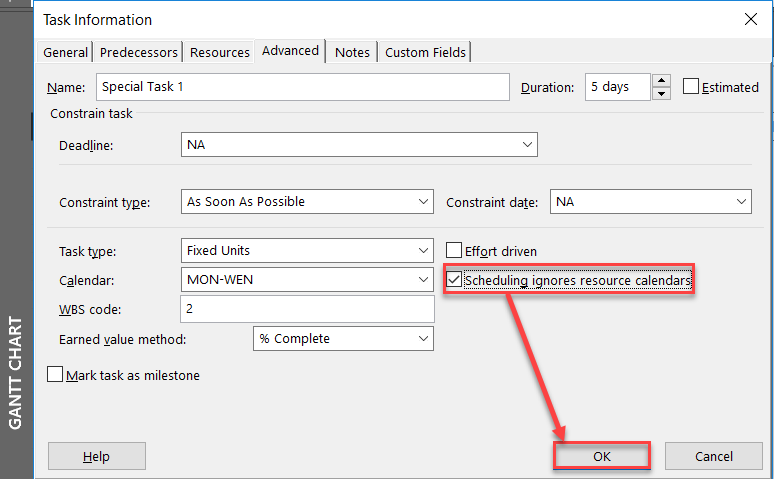 for those Task we will have to create Task calendar and Assign it to those, specific Tasks. As you can see in Information column I have a notice that those Tasks has specific calendar, and Finish date is moved. What will happened if I try to assign John to the Special al Task? As you can see, John is now allocated to this Task, but it is show as over allocated, because this is conflict with his Calendar. So he will work to this Task, even he is not supposed to. Now, finally, in this example we should as ourselves a question: “But what if John is really not available from Monday to Wednesday?”. Well in this situation you will not assign it to the Task. So what are our options? Only two of them. Find another resource who will be available to work from Monday to Wednesday on those Tasks, or change Task Calendar (so make this location available on Thursdays and Fridays). If those are not options, then you are not going to be able to do the Task. As simple as that. Remember, MS Project is a tool. Real life is something else. 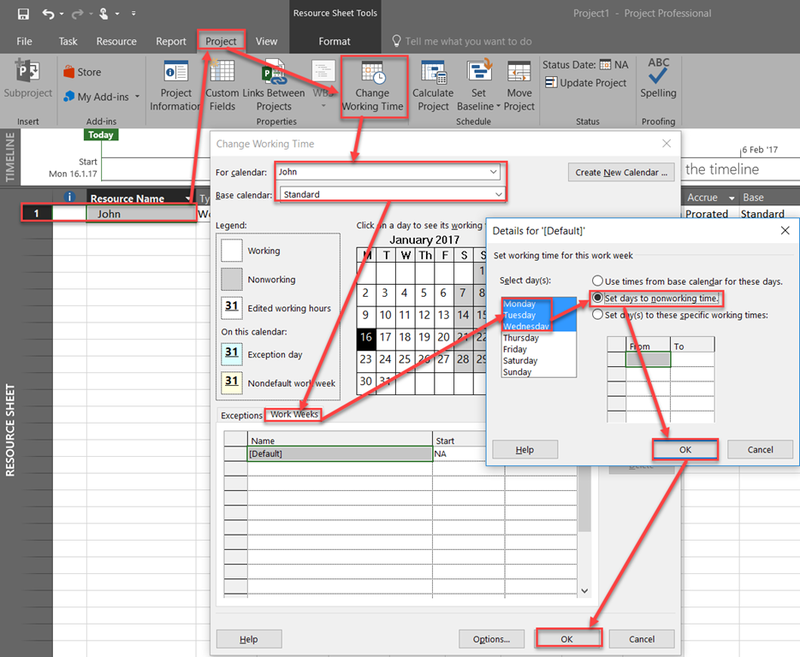 This entry was posted in Micsrosoft Project 2016, MS PROJECT 2016, PMI, PRoject Management and tagged Micorosft Project 2016, Micorosft Project 2016 - calendars, Micorosft Project 2016 - Schedule. Bookmark the permalink. Hi my name is Rodrigo and I am from Chile. About this post I have two questions. 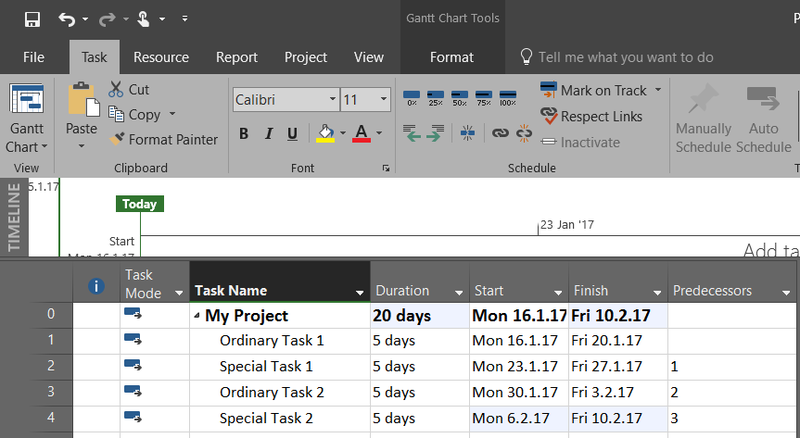 The special task calendar have to have the same time range of the project calendar? 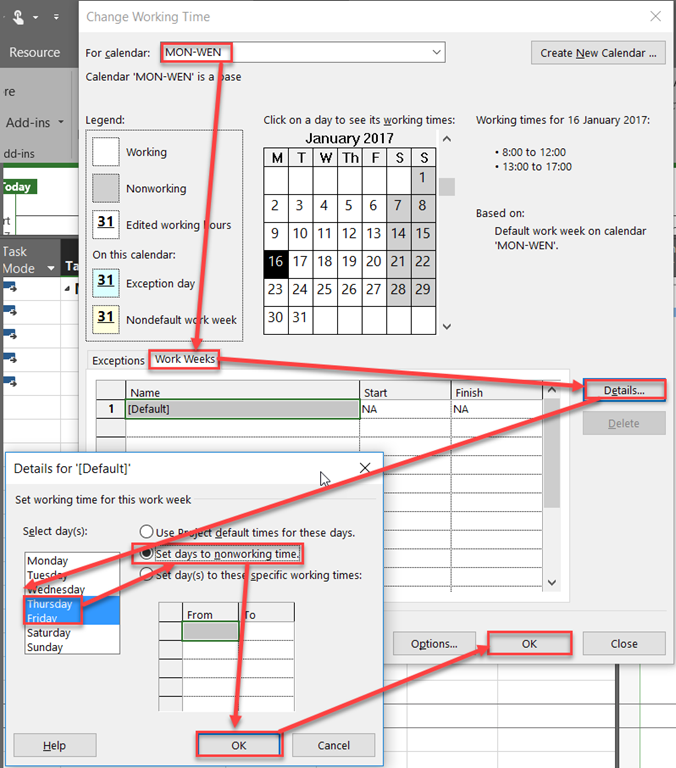 What happens if the task calendar have a different time range?For example 8:30-13:30; 14:30-17:30. 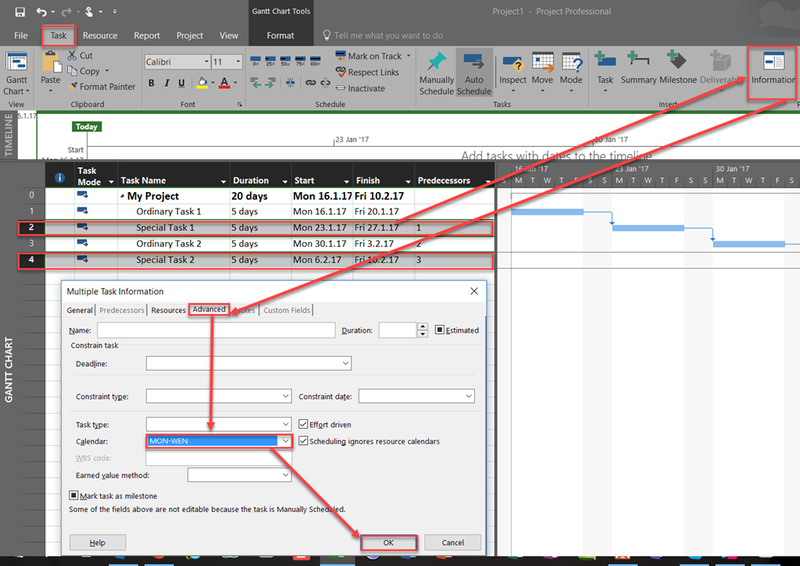 The second question is: in the duration column I have to consider the task calendar or the project calendar?